Plunger tracking with ETC plunger lift controllers - Extreme Telematics Corp. When is the optimal time to service or replace your plunger? As you may know, we occasionally release new features for our plunger lift controllers based on feedback from our resellers and producers. Upgrading your controller with the latest software is easy with our free ETC VisionTM utility. 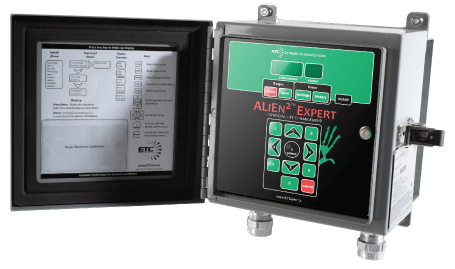 We designed our ALiEn2 controller with the ability to remove the electronics from the enclosure quickly and easily, no tools required. Pop out the electronics, plug in to your windows-based laptop and in 2-3 minutes you have the most up-to-date software on your controller. Travel Distance – Total distance that the plunger has traveled since the last reset. Plunger Arrivals – Total number of plunger arrivals since the last reset. Reset Time – Shows the time that the plunger statistics were last reset. For more information, please refer to section 6.1.2.5 (page 49) of the ET-1200x Installation & Operations Manual. You can use this information to help you decide the optimal time to service or replace your plunger. Some SCADA systems even allow you to set alarms, sending you a text or email when it’s time to service your plunger. At ETC, our goal is to help you make better use of your time by providing the most reliable, user-friendly electronics in the industry. Our products are always evolving, so if there is a certain feature or set of information you want access to in our controller, let us know. Your feedback is very valuable to us as we strive to produce the best solutions on the market.